They’re out there. In twenty-plus years of teaching and hanging around schools, I can say from experience that some of my friends and colleagues match the stereotype of the ardent, left-wing teacher, seeing their mission as introducing students to the disgusting excesses of capitalism. And maybe wearing scarves. And just as certainly, some teachers embody the tough-talking stereotype of the conservative teacher, pooh-poohing fads and frills and hoping to reach kids with the glories of self-sacrifice and flag waving. As the recent rash of teachers’ strikes has shown us, though, trite stereotypes of left and right don’t really help if we want to understand the cultural politics of teaching. There shouldn’t be any doubt about the real reasons for these teacher strikes. In Oklahoma, West Virginia, Kentucky, and now Arizona and Colorado, teachers and public schools have faced crummy salaries and crummy conditions. Oklahoma’s teachers have shared pictures of their classrooms, textbooks, and paychecks. It’s not pretty. I’m not so sure. But I can’t help but notice that pundits from both left and right have always assumed too quickly that teachers are somehow naturally politically progressive. In my research into the twentieth-century history of educational conservatism, for instance, I found that conservative activists assumed without even thinking about it that teachers tended to be soft on socialism. we don’t think it is fair to use taxpayer money in a democracy to teach the glory of collectivism to the budding citizens of a democracy. will flavor their teaching with a bias in favor of the new collectivism which will subtly determine the content and method of their teaching. We all know, of course, that some teachers really are politically progressive. Just dip a toe into the blogosphere and you’ll find plenty of examples. Some teachers really do hope to shake children free of the cruel thinking that undergirds capitalist society. With all the attention to teachers in the recent spate of strikes, though, it’s more and more clear that political stereotypes and labels just don’t help much if we want to understand the way schools and teachers really work. Are today’s striking teachers really hoping to lead a comeback of organized labor? Maybe some are. Most of them are probably trying to pay their mortgages and teach their students. As reporters in Arizona found out when they interviewed non-striking teachers, there is no simple way to categorize teachers’ politics. Are the teachers who voted against the walkout “conservative?” Maybe. Sort of. Kinda. But that label doesn’t begin to capture the mix of reasons teachers gave for opposing the walkout. Life is about not getting what you want and finding a way to get it while you continue to fulfill your obligations and for me, my obligation is my contract. 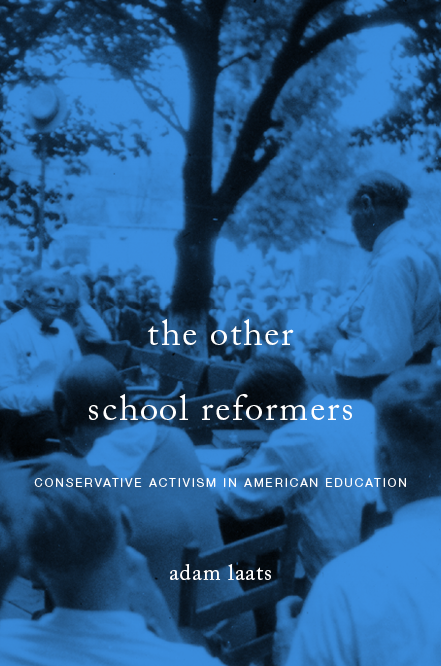 As I argued in my book about the history of educational conservatism, this notion of teaching students tough lessons about traditional morality has always been central to conservative thinking about schools and education. And of course he’s the football coach. The kids that I work with are at-risk kids … (the walkout) also puts them behind. A lot of them come from homes where it’s safer for them to be at school. A lot of kids I work with have severe and profound learning disabilities and their parents both have to work to provide for them. Now they can’t. Plus, at age 57, she can’t afford not to work. Does she want to be paid more? Sure. She currently works three jobs to make ends meet. A walkout, though, puts her finances and her students’ well-being at risk. Is that “conservative?” To this reporter, these walkouts help show once again that teachers are just as complicated as regular people. I get it. I wouldn’t want a middle-school social-studies teacher who hosts a white-supremacist podcast teaching my kid. I wouldn’t want her in my local school at all. But does everyone–even a teacher–have a right to free speech? Does our history of teacher purges have a lesson to teach us here? Does all this make her unfit for service as a public-school teacher? How about the fact that she bragged about disguising her views when her supervisor came around, but did her best to secretly promote them among her students? Should she be fired? IMHO, if Volitich really did engage in this sort of racist diatribe, she’s not worthy of the role of social-studies teacher. Moreover, if she knowingly and intentionally taught her ideas to her students subversively, she should be out on her ear. But the historian in me can’t help but ask: Is this situation different from Local 5? As Clarence Taylor has demonstrated, socialist teachers in New York City were purged for their political views. Between the 1930s and the 1950s, left-wing teachers were fired for their socialist ideas. They weren’t accused of bad teaching, but only of bad politics. It can be difficult to remember the heat and fury of America’s anti-socialism movement. For long decades, though, as I argue in my book about educational conservatism, socialism was viewed as nothing less than intellectual poison. Teaching it to students–or even harboring a teacher who harbored socialist ideals–was seen by many Americans as an outrageous abdication of educational justice. I feel the same way about this case. I can’t imagine allowing a white-supremacist teacher to sneakily insert her horrible views into a middle-school classroom. But when I call for her dismissal, am I repeating the travesties of the twentieth century, only from the other side?